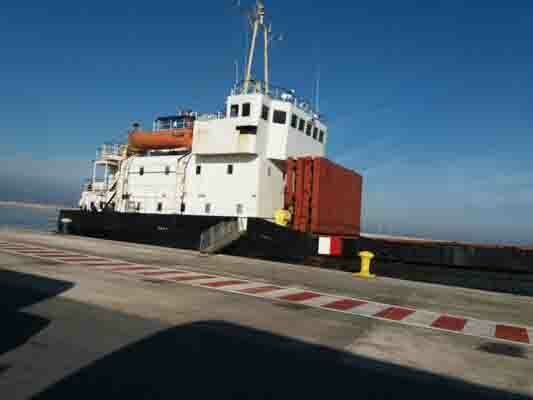 The Tanzanian-flagged Andromeda was seized by Greek authorities shipping potential explosive-making material from Turkey to Misrata (Photo: Greek Maritime authorities). Greek authorities confirmed to Libya Herald the details of the ship they had sequestered carrying potential explosive making materials from Turkey to Misrata. The Hellenic Coast Guard Headquarters confirmed that last Saturday a lifeguard boat detected the ship Andromeda sailing off the sea of Agios Nikolaos, near the island of Crete under a Tanzanian flag. The ship was boarded by the Special Mission Deployment Team of the Greek Coast Guard and the Customs Office of Crete. By Monday the Greek authorities decided to check the cargo of the ship thoroughly, which consisted of 29 containers and 11 LPG tanks. The Andromeda was then ordered to the port of Heraklion, Crete, accompanied by the Greek Coast Guard. On board the ship were 8 crew, including two Ukrainians, five Indians and one Albanian. According to ship’s bills of lading, the containers were loaded from the port of Mersin Turkey destined to a Djibouti landing port. The LPG tanks were loaded from the Turkish port of Iskenderun destined for landing in Oman. The ship’s entire cargo was unloaded and checked by Greek authorities. This confirmed the contents to be: 29 containers of explosives – detonators and other equipment. Similarly, it was confirmed that the 11 LPG tanks were empty. At the same time, on Tuesday a ship inspection was carried out by the local Heraklion Inspection Department and a total of 102 serious observations and omissions were found regarding the ship’s seaworthiness, deemed to be endangering the safety of the ship, the crew and cargo. During the preliminary investigation it was revealed that the master of the ship was instructed by his owner to go to the port of Misrata to unload and deliver the entire cargo, contrary to the UN Libya arms embargo. In addition, the spokesperson for the Greek Coast Guard said that a log record was found on the ship, but no ship maps were found for the Djibouti and Oman areas. As a result, the crew of the ship, following an order from the Piraeus Prosecutor, was arrested for serious violations of articles of the Civil Code. The cargo as well as the ship were seized. The Greek authorities also informed the competent Anti-Money Laundering Authority and the Terrorism Fund of the sequestration of the ship and its contents. A search on the ship’s history also revealed that the previous name of Andromeda in 2013 was Lotta and its home port was St. Petersburg. The general cargo vessel was built in 1979 by the Rauma Repola Uusikapunki Yard from Finland, and is now managed by a Tallinn based company in Estonian. In September 2015 a ship also loaded at the Iskenderum port, some 50 km’s from the Syrian border, was seized off Crete headed for Misrata. It contained 5,000 shotguns and half a million bullets concealed beneath gym mats floorboards. It is not the first time that Andromeda has been involved in problems in European waters. The vessel was detained in Eleusis, again in Greece, on 4 August 2017 because the Tanzanian flag was blacklisted by international maritime authorities. This could have been the reason why the vessel raised an alarm with the Greek maritime authorities. It is also probably not the first time that UN embargo on arms to Libya has been contravened. There have been numerous accusations – by both sides in Libya’s political divide – of its contravention, including by the UAE and Egypt to Libya’s eastern-based forces under the command of Hafter. Khalifa Hafter’s Libyan National Army has also claimed that Turkey, along with Qatar and Sudan, helps fund terrorism in Libya. Since 2011 Libya has been subject to an arms embargo, something that many figures including Hafter and Presidency Council head Faiez Serraj have asked to be lifted.